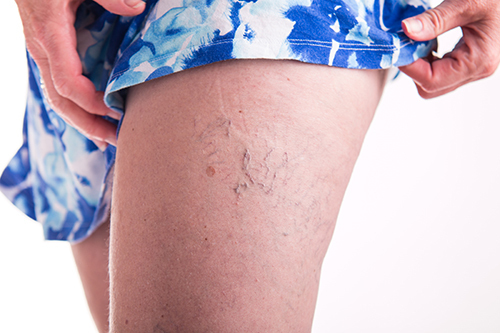 Unfortunately, most everyone knows what spider veins are. They are so common they are almost a right of passage. They are the unattractive thread-like (1mm or less), red, blue or purplish veins that are commonly found on the calves, thighs and ankles. They often occur in clusters and can have a spider web-like appearance. They result from high pressure in the smallest of veins called venules. These engorged small veins then expand to several times their normal size, making them visible. Spider veins are associated with “feeder veins” or larger underlying reticular veins. Because of this, it’s imperative to identify and treat these underlying causative veins in order to prevent them from recurring in the same location. Clusters of spider veins, especially around the ankles, can be a symptom of a deeper venous problem, so a complete venous examination is recommended. There are many ways to treat spider veins, but most important is to identify the cause of the spider veins to prevent re-occurrence. Once the source is found, treatment will begin and will take on average 3-5 sessions spaced about 4-6 weeks apart to clear your spider veins permanently. However, some people are pre-disposed to having spider veins, so it is possible to develop new ones. Heredity: The leading cause of spider veins, a family history of them will determine your predisposition to developing the same. If you want to learn more about Spider Vein Treatment, Dr. Rothstein can provide you with additional information during your complimentary consultation. Contact us by calling our office or by filling out the form below.